I spent this past weekend at a creative non-fiction writer’s conference with my mom. We had such a great time spending our days attending lectures, panels, readings, and story slams, usually with a cup of tea or coffee in our hands. Creative non-fiction isn’t even my primary genre, but I thought it would be beneficial to branch out a little and explore some new things. This post is by Positive Writer contributor The Magic Violinist. And I was right; I received great advice from various memoirists and freelance writers about craft, the publishing industry, and marketing. But early on something became apparent: the knowledge I gained was contradictory. In one lecture I was told to buy a planner, set strict deadlines for myself, and track my progress with steadfast determination. In another presentation, I heard that deadlines ruined the magic of a good story and that we writers shouldn’t be so hard on ourselves. In the morning, I was urged to write my first draft as quickly as possible and to churn out new work every day. By that afternoon, someone suggested to focus on quality instead of speed or quantity. It can be a little overwhelming, especially for new writers trying to figure this whole thing out. So how are you supposed to sort through the information and find out what’s true? Do you look at the credentials of the author writing the article? Do you follow whatever advice is being told the most often? Do you ask your fellow writers for help? The truth is, it doesn’t matter what advice you follow, so long as it works for you. Writing, like all art, is subjective. While there may be certain writing styles that are held in high regard, it’s still all based in opinion. Sitting in a class on writing isn’t like taking a math class; there’s no one right answer. Some authors will try to tell you that rising before the sun is a must if you’re ever going to get anything done. After all, aren’t the early hours the best ones for productivity? Shouldn’t you try to crank out 3,000 words before even shuffling to the kitchen for breakfast? As a night owl, I’ll be the first to tell you that it is not necessary for you to drag yourself out of bed at some ungodly hour to blink bleary-eyed at the screen in front of you and try to coax your tired and clumsy fingers into typing out comprehensible sentences. If setting the alarm an hour earlier makes you more creative and productive, by all means, go for it. But it is not the only way, nor should it be. If there were one tried-and-true writing process, we would all be brilliant, bestselling authors and websites like “Positive Writer” would be useless. Thankfully, there is no one process and websites on writing live on because of it. The beauty of art is that we as the creators get to experiment all the time with different methods of getting words down on the page. If you’re feeling stuck with your current routine, switch it up. Take some of that contradictory advice you received and try something new. What works for one writer will not work for another, so it’s up to you to test your options. Eventually, you’ll find something that helps. Don’t be overwhelmed when you find yourself surrounded by articles that all tell you different things. Instead, view those opposing opinions as a writing buffet. Pick and choose whatever looks good to you until your plate is full, but don’t feel pressured to finish it all or go back for seconds. This is your chance to taste test and play. Trust me when I say, one day, something will stick. What do you do with conflicting information? How do you decide what advice to follow? Leave a comment! This entry was posted in ebook, Publishing and tagged Daily Writing Tips, DailyWritingTips, editing tips, Motivation, positive, tips, writing career, writing goals, writing tips, writing tools on September 27, 2018 by First Edition Design Publishing. Leaving your story open-ended is an interesting but risky approach. Open-ended closing chapters may work in a literary novel. Yet in a genre romance novel, readers typically expect that lovers will be united. What makes an open-ended story satisfying? It allows the reader to imagine, to fill in the blanks. Without a guide for how we should interpret the final scenes, we’re free to decide for ourselves what they mean. An example of an open ending: An anti-hero killer ends up relocating and going incognito. This ending was used by the writer’s of the Showtime TV adaptation of Jeff Lindsay’s Dexter series. Not giving a final conflict or confrontation leaves room for future installments. Resolve secondary conflicts and arcs so that there is at least some sense of resolution. For example, even if a primary villain lives to fight another day, perhaps their henchmen get their just desserts. Don’t mistake an open ending for letting the story peter out – even if there is no decisive conclusion, maintain tension to the end. Know your reason for leaving your story open-ended. Perhaps you want to convey a specific message (in the case of the example above, it could be that sometimes ‘bad’ people get away with bad deeds). David Mitchell’s novel Cloud Atlas is an excellent example of this type of novel ending. In his sci-fi adventure novel, Mitchell hops between eras and locations from section to section. Each section ends on a cliffhanger or with an unknown unexplained. The author resolves each story arc in reverse order from the middle. This creates a sort of mirror structure around the central post-apocalyptic section. Cloud Atlas ends with the resolution of the first interrupted story arc. We learn the fate of a character taken ill aboard a ship, and a shocking twist about a primary relationship for the character. Mitchell thus returns us to the first set of characters, and the novel’s first time setting and style (the first and last sections are written as journal entries at sea). This mirror or cyclical structure gives Mitchell’s novel a particularly satisfying sense of completion. The plot twist is a typical ending for the short story. Famous short fiction authors such as O. Henry and Edgar Allan Poe mastered the ‘twist in the tale’ ending. Yet this can also be a satisfying ending to a longer work of fiction. Masters of the surprise ending include the authors Kazuo Ishiguro and Ian McEwan. Identity reversal: In which ‘someone turns out to be someone else’. A character is not who we (or other characters) thought they were. This is a common ending type when there is an unreliable narrator. Motive reversal: In which the reader assumes a character is acting out of the desire for x when what they really want turns out to be y. For example, we think a character seeks a lover because they’re romantic, but they turn out to be controlling and power-seeking. Perception reversal: In this type of story ending, the protagonist realizes their world or their understanding of it is out of step with reality. This is a common ending type in Poe’s dark, Gothic stories. Fortune reversal: Here a character is brought low or elevated to new highs by a stroke of luck or unforeseen circumstances. Dickens’ Great Expectations is an example. The character Pip inherits a fortune from a mystery benefactor, who turns out not to be the person he thought. Fulfillment reversal: A character reaches the goal of their primary motivation. But another character’s actions undo their hard work. 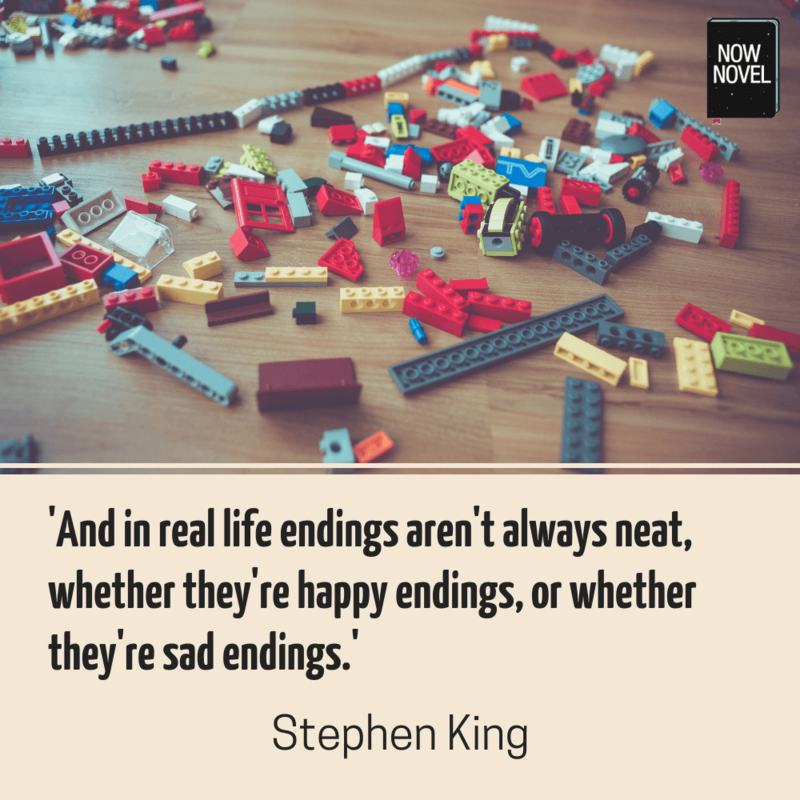 An ending doesn’t have to be shocking or surprising. Yet surprising reversal endings give readers the uncanny feeling of having been duped. This sense of surprise can make your climax more dynamic and exciting. A twist ending, especially a shocking, discomforting one, carries the risk of angering readers who were looking forward to an expected resolution. Sometimes you’ll simply want to give readers what they expect and desire of a novel in your genre. A tidy wrap-up can be comforting and reassuring – it’s why most childhood tales end with ‘happily ever after’ (or simply the reassuring finality of ‘the end’). If you want to explore your fictional world further over a series of books, cliffhangers are effective story endings. Think of how screenwriters handle plot arcs in thriller TV series. While each major plot arc of each season is mostly resolved, there is something left over that leaves viewers hankering for the next season to start. The bodyguard’s ward may be killed and they fail in their main task, but they (and us) still need further answers. Who was the culprit? What was their motivation? Think of each book in your series as a season. Building the ‘what next?’ into your closing chapter will keep readers on the lookout for your next installment. It also helps to stop your resolution from feeling too tidy and convenient. There’s no reason why you should have to stick to just one of the story ending types listed above. There’s no single correct answer for how to end a novel. A simple return to the beginning can be effective, but the way David Mitchell returns to the beginning in Cloud Atlas with new information is both complex and satisfying. It’s a combination of a ‘full circle’ ending and a final twist. Explore ways you can combine different types of ending to provide some surprise and some satisfaction. A deus ex machina describes when an unlikely story event provides a quick, all-too-convenient resolution. It usually feels contrived. The term is derived from the ancient Greek for ‘God from the machine’. In the Greek theatre, actors playing Gods would be lowered onto the stage on a rope via a crane-like contraption, usually to resolve primary conflicts. 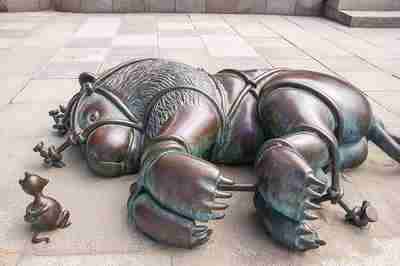 Try to avoid lowering in convenient Gods near the end of your story on obvious rope. 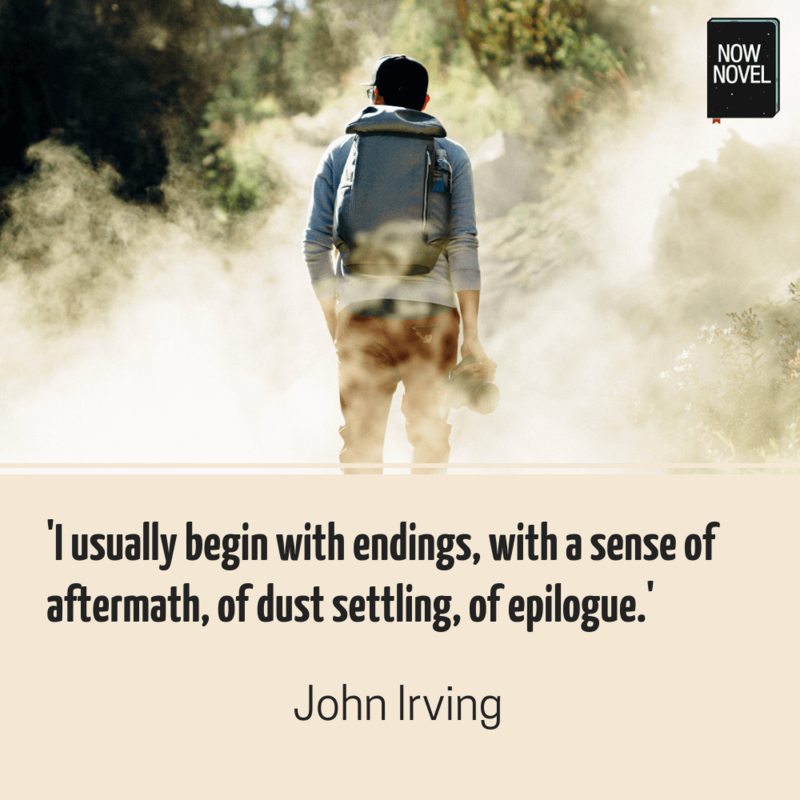 The end of a novel serves multiple important functions: It resolves major questions raised by preceding plot events (or purposefully leaves some unanswered). It clarifies and rounds off important ideas or themes (reinforces the ‘point’ of the novel). It also shapes the lingering impression readers will have of your story as a whole. Avoid moving your story to an end without sufficient build-up and release. The best story endings weave together all the different threads that have been laid out before the reader. It’s often subtler to do this over several ending scenes or chapters. This is often smoother than hurriedly tying all your characters’ arcs up in a clumsy knot. This being said, there are no ‘rules’. Bret Easton Ellis ends The Rules of Attraction mid-sentence. However you choose to end your story, know your reasons. This entry was posted in ebook, Publishing and tagged Daily Writing Tips, DailyWritingTips, editing tips, novel, novels, story ideas, Storyline, Storytelling, tips, writing tips on September 27, 2018 by First Edition Design Publishing. With an extreme simplification, creative writing can be considered any writing in which authors make things up. It’s sort of like creative accountancy, but with three important differences. Firstly, your chances of becoming rich with creative writing are slim at best. Secondly, also your chances of ending up in a jail if you pursue a career in creative writing are pretty slim. Lastly, creative writing is aimed at a public as wide and eager as possible whereas the gurus, so to speak, of creative accountancy aim at being read by as few people as possible. And the more the reading is superficial and inattentive, the better. But the truth isn’t always immediately obvious. And in fact, creative writing offers writers and readers alike the opportunity to experience sheer pleasurewithout having to resort to any illegal substance or activity—of course, apart for those unfortunate people living in parochial parts of the world where books still get banned. However, creative writing doesn’t mean we can write whatever we feel like without ever having to think about rules, guidelines, and principles. Essentially the reasons for this are twofold. In (1) I just wrote a phrase with invented words. But even so, these words are not entirely casual. In fact, for example, they follow some principles about ease of pronunciation. Besides, they are arranged in a way that, at least superficially, seems to reflect the English construction of (3). In (2) we have another perfectly formed phrase. It only happens to be in Spanish–Javier said so. This makes it apparent that the first rule about communication is about which shared language we should use. And only then about the rules we should follow within that language. 3) Here we have a phrase we can process and understand. But only to a certain extent. In fact, Jack could be a horse. ‘Your’ could refer to the reader. Or maybe to an animal. Not necessarily to a human. And so on. This is to point out how a language can never fully express meaning if its users don’t know how it relates to the world. The second reason we need guidelines and principles, and sometimes even rules, is that even if at times rules can be perceived as unwarranted constraints, they nonetheless spur creativity. Just think of the way poetry works. Of how poets, who often follow strict rules of composition, manage nonetheless to come up with splendid poems all the time. At first blush this seems idiosyncratic. But it’s perfectly natural. It’s like with training. If our body never has to face any kind of stress, it gets weaker and less healthy, not the other way around. This happens because even if too much stress can be dangerous, a moderate amount of it is essential to keep us in shape. And principles and rules represent exactly the literary equivalent of a healthy dose of stress. In fact, they can certainly be tiresome at times. But they exist for a reason. To help us make sense. And say what we really have to say. This doesn’t mean rules have to be always observed fanatically. On the contrary, there are times rules must be broken. But we must know them perfectly if we want to know when they are no longer helping us, when they prevent us from saying exactly what we have on your mind. Some rules are easy to follow. Others are difficult even to understand. Others still seem arbitrary. But if we invest time in learning them adequately, the payoff will be huge. I mean, our daily word quota isn’t necessarily going to increase, but gradually we’ll acquire the ability to spot all those a passages where rules need to be followed instead of broken out of sheer ignorance. We’ll also get better at spotting those few passages where rules actually are a hindrance. This entry was posted in ebook, Publishing and tagged creative writing, Daily Writing Tips, DailyWritingTips, editing tips, tips, Writers Write, writing, writing career, writing tips, writing tools on September 25, 2018 by First Edition Design Publishing. Should Beginning Writers Imitate the Greats? Learning often begins with imitation or copying. As babies, we learn facial expressions and gestures by mimicking adults. Children learn to write their letters by copying them from workbooks. And can you imagine a musician learning their craft without first leaning to play other musicians’ songs? But we rarely explore the question of whether writers should copy the work of great authors as a learning exercise. In the world of fine art and entertainment, imitation is sometimes viewed as flattery, but mostly it’s criticized for its lack of originality. Works that appear to be based in part or in full on other works are called derivative works. Some derivative works are celebrated — for example, writing a variation of an old fairy tale or writing a modernized version of an ancient text. Each work should be judged individually and on its own merit, and opinions will vary. However, today we’re not talking about the writing that we publish for the world to see. We’re exploring the idea of using imitation strictly for the purpose of study, practice, and learning. When I was a kid, I often wrote down the lyrics to my favorite songs. I would play the song, pausing and rewinding it every few seconds to figure out the lyrics. Sometimes, I’d write my own lyrics to the tune. I believe this formed the foundation of learning musicality in writing, which I later applied to my poetry. As a young poet, I discovered Maya Angelou’s “Phenomenal Woman.” While I didn’t set out to imitate this amazing poem, I did set out to write a poem that was inspired by it (and somewhat modeled on it). All these years later, I suspect that if I shared that old poem of mine (which was titled “Woman One”), any knowledgeable poet would know that I’d read Maya’s work and was influenced by her. All of these exercises helped shape my writing skills. When you copy the words that someone else has written, you study them more closely than you would by merely reading them. But notice that none of these exercises resulted in published works. It was a form of study and practice. Who hasn’t buried themselves in a novel, only to put it down and find the voice of the narrative continuing inside their own mind? Copying a text can have the same effect, but it works faster. It’s a useful way to learn how different authors structure sentences or make word choices. When I was in a college literature course, we took a test that required us to identify authors’ voices. We were given short excerpts from various authors’ works. We weren’t expected to memorize these authors’ repertoires, but we were expected to absorb their voice (style). A good way to do that is to copy passages from the authors’ writings. The act of typing (or handwriting) their texts helps us absorb it much faster and more thoroughly. There are many ways that authors borrow, build upon, and steal other writers’ ideas. There’s really nothing new under the sun — only old ideas remixed and rehashed into works that feel fresh and invigorating. But however we gather our ideas or develop our craft, learning is a necessity. We must do the work to develop the skills we need to achieve our goals. For writers, that means studying language, mastering vocabulary, and learning structure and form. Not all writers need to learn through imitation. Each of us has a different learning style, but for those who would benefit from imitation as an exercise, it’s a worthwhile endeavor for skill-building. Have you ever used imitation to develop your knowledge or skills? What did you imitate and why? Did it work for you? Share your thoughts about imitation as a learning tool for writers by leaving a comment, and keep writing. This entry was posted in ebook, Publishing and tagged Daily Writing Tips, DailyWritingTips, editing tips, tips, Writers Write, writing career, writing goals, writing practice, writing tips, writing tools on September 22, 2018 by First Edition Design Publishing. It happens to all writers. You’re cruising through a story, and all of a sudden you hit a wall. Your characters freeze up, your plot stops cold, and you’re stuck with nowhere to go. You’ve hit a fiction writing roadblock. All of your ideas have evaporated and you sit there staring at your screen with a blank look on your face. Where were you going? How did you write yourself into a corner? More importantly, how do you write yourself out? Fortunately, there are techniques you can use to break through the creative blocks that arise in the middle of a storytelling project. Some of these techniques also come in handy when developing ideas for new fiction projects. The main thing you need to remember is that hitting a roadblock does not have to mean the end of your story, your fiction writing, or your creativity. You just need to reboot and see your project from a fresh angle. The techniques explained here are sledgehammers. They’ll blast through walls, blow away obstacles, and create doorways that you can step through to reconnect with your story. Is your character stuck in a situation with no way out? Has your character gone on strike, refusing to take further action? Are secondary characters loitering around with nothing to do? Try removing the troubled character from the story you’re writing and placing them in a completely different situation. You don’t have to write a novel, but sketch some ideas about how your character would behave in various scenarios. Then bring them back to the story you were working on and see if your creative wall hasn’t cracked. Fiction writing exercises provide a constant stream of ideas. You can find websites, magazines, and books that provide activities to kick your writing and your imagination into high gear. Look for exercises that are specific to the problems you’re having. If your plot isn’t going anywhere, find plot exercises. If you are having trouble with dialogue, look for dialogue exercises. I wrote Story Drills: Fiction Writing Exercises for storytellers who need guidance and inspiration — it has a little of everything and can knock down all kinds of creative walls. Sometimes we get stuck because something’s wrong with the plot or structure. If you’re writing a manuscript, it will be difficult to see the bones of your story. Convert your manuscript into an outline that lists all major plot points. Then you can more easily see where the story took a wrong turn. If you’re having character problems, create outlines that show character arcs. Keep using these outlines to find and resolve problems in your plot and structure. Sometimes the biggest problem with a story is that it’s flat. The characters are lackluster; the plot is boring. This is likely because these story elements are underdeveloped — there’s not enough detail or depth. Pause work on your manuscript to work on developmental projects like character sketches, plot outlines, world-building, and research that will add layers of detail to your creative vision, which will then get fleshed out in your writing when you resume work on the project. Sometimes what’s missing isn’t detail but entire chunks of a story; if your story feels thin, then you can add characters and subplots to plump it up. I had written multiple drafts of a novel when I was struck with a new character. I didn’t think much about it — I just started writing a chapter about her. It became the first chapter of the novel and she became the thread that tied the entire series together. Similarly, you might find that your plot lacks dimension; introducing new story threads and subplots can make your tale more dynamic. We all grow blind to our own strengths and weaknesses. Maybe you’ve started to think your story isn’t as great as you originally envisioned. Maybe you have a nagging feeling that something is wrong with it, but you’re not sure what. This is often a good time to get a second opinion. A writer friend is ideal for this, but you can also work with a developmental editor or a writing coach. Find someone who you trust, who is knowledgeable about writing (and your genre), someone who will give you honest feedback and help you get back on track. Sometimes the mere act of discussing the project with another person will illuminate the problem and reveal a solution. Storytelling is not an easy endeavor, and the best traits for writers to cultivate are patience and determination. Sure, some stories are destined for the recycling bin. Successful writers produce a lot of garbage before they eke out a gem. But don’t give up on a project when you hit your first roadblock. If you do that, you’ll never get anywhere. Whether you write yourself into a corner, lose interest in your plot or characters, or get tempted by a newer, shinier idea, stick with your project and see it through to completion. Pay attention to what’s going on when you’re at your most creative and learn how to get into that state on command. Writers need to get to know how their minds work and what brings out the best ideas. This is how each writer develops a reliable set of techniques or a routine that produces good results. Also, stock up on creativity resources. Look for books on creativity and expose yourself to plenty of art and entertainment. Also, try other creative outlets, such as painting, dancing, photography, or music. Remember that like attracts like, so the more creative you are, the more creative you’ll be. How do you break through fiction writing blocks? Share your thoughts and ideas by leaving a comment. This entry was posted in ebook, Publishing and tagged Daily Writing Tips, DailyWritingTips, editing tips, tips, writing career, Writing Forward, writing goals, writing practice, writing tips, writing tools on September 21, 2018 by First Edition Design Publishing. Do you want to boost your writing productivity? You’re very hard on yourself, especially when things go wrong. You spend more time than you should on a task because you want it to be done just right. You have extremely high standards, and will sometimes sacrifice your own well-being to complete a project perfectly. You’re the first to find errors and correct them, knowing that finding mistakes in a completed project will drive you nuts. You tend to ruminate over past mistakes and always vow not to repeat them. If you found that two or more of these described you, you tend toward perfectionism. If you related to more than that, you may be a full-blown perfectionist. Now don’t panic. Perfectionists sometimes get a bad rap, but there are good as well as bad things about this trait. You are probably a determined, hard-working person, for example, who is always trying to improve. Your completed projects are most likely of high quality, and you’re probably good at editing your own writing, because you actually enjoy finding flaws and fixing them. But there’s no doubt that your perfectionist personality is also likely to make it difficult for you to open up time in your schedule to write. Here’s why, and what you can do to boost your creative productivity. Most writers struggle with time management these days—it’s just hard to find ways to squeeze in writing time with all the other things we have going on in our lives. 1. They spend too much time trying to get every project just right, which makes them less productive overall. 2. They fear failure, so they resist starting a project until they feel “ready.” The term for this is procrastination, and it will keep a perfectionist from ever completing a book or other creative project. 3. They are always critiquing. They edit their work as they’re writing it, which makes it difficult to get into a rhythm of creative output. These three factors slow the perfectionist writer down at every turn. They not only stall his progress on his creative projects, they also slow him down on everything else he does in life, creating an unbearably long to-do list and the feeling of always being behind. Perfectionist writers often compensate by working harder and longer to make sure everything is perfect, from their next novel to their next blog post to their next email to their children’s homemade lunches, to the point that they eventually buckle under the demanding load. The result can be exhaustion and depression or even a serious illness. This side of perfectionism isn’t fun—ask those who suffer through it. If you’re one of them, you may be all too familiar with your own tendencies to grade yourself on everything, ruminate over even small mistakes, and resist letting a project go until you’ve beaten it to death. None of us can really change our innate personalities, though, so what are perfectionist writers to do? Are they doomed, or can they adjust just enough to make more time for their creative work? 1. Find areas where you can let up: Perfectionists tend to want everything to be perfect. Try to identify projects that don’t matter as much, and practice allowing them to be sub-par. Remember that you want to make time for writing and your other priority projects, so make a list of less important things that don’t need to be perfect and practice spending less time on them. You’ll probably never feel comfortable letting some projects go before they’re “ready,” but you can get better at it. 2. Realize that your standards are super high: Step back for a moment and realize that it’s likely your standards are super high. There’s no real definition of “perfect” for most of the things you do in life. What’s the difference between a clean bathroom and a perfectly clean bathroom? You can probably tell, but most people can’t. Simply remembering that can help you go easier on yourself. When you think something is “okay” but not yet “perfect,” realize that “okay” is probably good enough in most cases. 3. Practice being productive: Studies have actually shown that perfectionists are less productive than others. (Read more about productivity in C. S. Lakin’s post, “Boost Your Productivity: Getting to the Core of Your Distractions.”) When you’re agonizing over one project, you’re slowing yourself down and stealing time from the other things you planned to do (like writing). Make productivity your goal instead, and let your perfectionism work on that for a while! 4. Carry a timer around: One way you can practice being more productive is to carry a timer around with you (or use an app on your cell phone). Give yourself a time limit for each project you take on during the day. Fifteen minutes to write that important email—when the timer goes off, send it! An hour for that work report. Thirty minutes to make dinner. An hour to clean the house. Push yourself to work more quickly, and adhere to your allotted time. It will be painful, but the more you do it, the easier it will become. Go go go! 5. Forgive yourself: Perfectionists are super hard on themselves, ruminating over every mistake. This can create a stressed out mind, which is horrible for your creativity. What you need is to practice forgiving yourself. That typo in your query letter? It’s not the end of the world. That forgotten soccer game? Your child will forget about it (eventually). Your favorite phrase should become, “It’s okay!” Particularly when you’re writing, allow yourself to be just who are you are on the page, flaws and all. You may find it so freeing that your stories become even more imaginative. 6. Practice fooling yourself: If your perfectionist tendencies make you likely to procrastinate, find ways to fool yourself into getting started. Tell yourself you’ll write for only five minutes, or that this isn’t the “real” draft, but just a “practice” one. Set a timer and don’t allow your fingers off the keyboard until it dings. Do whatever you have to do to get past that internal editor and start writing. 7. Make failing a game: Perfectionists fear failure. They work to get everything just right so they don’t fail. Make it a game to see how many mistakes you can commit. Not by faking it, but by trying new things more often. Send out more submissions. Query more agents. Try out more types of writing that are unfamiliar to you. Submit your work to more contests. Gradually, you may start to have more fun with the whole thing, and failure won’t seem like such a big deal. You may also surprise yourself at the successes you experience! If your fidelity to perfectionism is too high, you never do anything. This entry was posted in ebook, Publishing and tagged Daily Writing Tips, DailyWritingTips, editing tips, tips, writer, writing, writing career, writing goals, writing tips, writing tools on September 19, 2018 by First Edition Design Publishing. As a copy editor, I’ve learned a lot about improving the flow of my own writing as I’ve tweaked the manuscripts of others. Today I want to share five easy edits you can make yourself that invite the reader deeper into the story and provide the impact you want to have. Crutch words are words we lean on too much in our writing — used when unnecessary, repeated too often, diluting the point. Like many definitions, it’s easier to understand when you see examples. Here are a few: just, so, definitely, really, very, suddenly, and (at the beginning of sentences), smiled, shrugged, knew, saw, heard. Adverbs are most often the culprits, but you might wonder what’s bad about knew, saw, and heard. Nothing is wrong with any of these words used well, but we tend to misuse or overuse them. It’s a crutch when you write, “I knew I was going to be in trouble,” when “I was going to be in trouble” is the same thing and a deeper point of view (POV) anyway. The same is true with saw and heard. If a POV character says a bell tolled, we know they heard it. Bonus thought: Curse words can easily become crutch words too. Make sure you treat each like you would other words; that is, imagine substituting another common word in its place. If it feels overly repetitive, you have too many instances of that curse word — it’s become a crutch and can interrupt the flow of the read. 2. Finish strong with sentences and paragraphs. Way back when I was in college, I learned about the recency effect. Psychologists have shown that we remember what we heard or write mostly recently better than what’s in the beginning and especially the middle. For this reason, deleting or moving around a few words in a sentence can make a real difference in the impact they have on a reader. Let’s take a quick example. Which do you think would have the recency effect a writer desires? The second clearly lets the word regret linger in the reader’s mind. Look for places where removing a few words or moving them around draws attention to the words you want to echo in the reader’s mind. 3. Substitute action or description for he said/she said. “I loved him like a brother,” she said. She placed a rose on his grave and wiped away a tear. “I loved him like a brother.” She placed a rose on his grave and wiped away a tear. Door number two, anyone? Simply run a manuscript-wide search for those he said/she saids and see if you want to make any deletions or substitutions. 4. Break up some paragraphs. When I edit my own books, one run-through always involves putting the book on my e-reader so that I can see it the way a reader would. The prose appears very different in this format than on a computer screen, and it’s easier to see large, clunky paragraphs that need to be broken up. Your book needs white space — that is, areas without text — to prevent the reader from being overwhelmed with the busyness of the page. Without sufficient white space, reading a book can feel like searching for Waldo; your brain gets overwhelmed. What’s the right size for paragraphs? It depends. What genre do you write? Historical will have longer paragraphs than thrillers. What’s happening on the page? Description tends to have longer paragraphs than dialogue. Who’s talking? An erudite POV character will have longer chunks of thought than a street thug. So you have to make that call. Regardless, make sure no page is so overwhelmed with text that it’s difficult for the reader’s eyes to focus. With so much of writing a book being hard, it’s nice to learn about some easy ideas for improving the flow of your story. These four easy fixes can help you achieve the impact you want to have on the reader. This entry was posted in ebook, Publishing and tagged Daily Writing Tips, DailyWritingTips, editing, editing tips, Storyline, Storytelling, tips, writing, writing tips, writing tools on September 17, 2018 by First Edition Design Publishing. Think about that for a moment (not a small one). Every book you have ever read is about a small moment—an epiphany when a character realizes an emotional truth with complete clarity. THE MONSTORE is not just about a store that sells monsters. It’s about a brother and sister who learn to appreciate one another and cooperate. 7 ATE 9 is about number 9 realizing his worth. LITTLE RED GLIDING HOOD is about not judging someone before you get to know them. Before I read Matthew Dicks’ STORYWORTHY, I used to phrase this “small moment” concept differently. I would explain that a story, especially a picture book, required an emotional core. Now I realize that is an amorphous blob of a statement. In other words, not very helpful. Likewise, if I told you my manuscript was about siblings who learn to get along, that doesn’t sound very enticing, does it? Sounds preachy and boring—been there, done that. However, frame that sibling story in a shop of misbehaving monsters and suddenly it’s a must-read. Small moments. They are what make your story BIG. You may ask, do I set out writing about small moments? NEVER. I begin with an appealing, kid-friendly premise about dolphins or aliens or robots or puppies. If I am doing my job correctly, my main dolphin is not going to be the same dolphin by the end of the story. That dolphin has changed. Not from a bottlenose to a pantropical spotted, but from a mean dolphin to a nice one. Or one who doesn’t believe in narwhals to one who does. That small moment of emotional transformation is what makes the journey through the waves (and the story) meaningful. Otherwise, it’s just splashing in the ocean. Your small moment appears with the story’s organic evolution. Often, if you begin with a small moment you end up sounding like a big know-it-all. Why? Because you can unknowingly force that theme into being. Never do I write in THE MONSTORE, “Zach and Gracie learned to appreciate one another and cooperate.” SNOOZEFEST. Instead, they open another Monstore together. That’s a lot more fun, and the small moment of transformation shines through. While STORYWORTHY by Matthew Dicks is about crafting personal storytelling narratives, it contains nuggets of writing gold applicable to picture books. I had a small moment myself when I read about small moments. So examine your manuscript. Does it contain a small moment? If you hear from an editor that your story requires another layer, that emotional epiphany could be the big answer. This entry was posted in ebook, Publishing and tagged children, childrens books, Daily Writing Tips, editing tips, short stories, story, story ideas, Storyline, Storytelling, writing tips on September 13, 2018 by First Edition Design Publishing. I’ve been studying thrillers because I’m about to write a thriller series. Even though I’ve written a couple of novels with thriller elements, I want to nail this genre. I want my novels in this series to fit right up there with best-selling authors. And that has involved a lot of work. I spent a bunch of money flying to NY to attend Thrillerfest (and I’m so glad I did!). I took a masters class, and all-day ATF workshop (the highlight of the week! ), I met with and shmoozed with best-selling authors. I listened to panel discussions. And so much more. In addition, I’ve been doing hours of research online. I’ve made phone appointments to talk with experts (FBI, ATF, park rangers, lightning experts, etc.). I am heading up to Seattle to scout locations and meet with local ATF special agents and park rangers in Mt. Rainier. Yes, I take my writing seriously, and that means I do my homework. Before I wrote my latest novel in my Western series, I went to Wyoming to get a feel for Laramie, the state penitentiary, and the environs. I also went to many museums, dug into newspaper archives, and read passages from books that I couldn’t check out and had been written decades ago that shed light on the 1870s (the decade in which my series is set). One of the most important things a writer can do, and which I’m in the process of doing now, is deconstruct best sellers in her genre. I can’t emphasize this enough. Few writers that I work with ever take the time to do this. Sure, they read mysteries because they want to write mysteries. But they aren’t tearing them apart. That’s so important to do! Why? Because best sellers in a niche genre have a specific structure. For example: I took four thrillers that I love, which are very different from one another, and I made a chart and briefly wrote a summary of the first four scene in each novel. I put the novel titles at the top of a sheet of paper and I put scene #1, scene #2, etc. down the left side. Guess what I learned just from this simple exercise? That those first four scenes accomplish very specific things. That those scenes have specific action and purpose. What did I do then? I plotted out my first four scenes based on their structure. I feel very confident that those scenes I write will be exactly what I need to kick off my thriller. I’ve written on how to write a sample chapter in your targeted genre. That’s a very helpful thing to do, and that’s my next step. Think about grabbing a half-dozen novels in your genre and try making a chart, like I do. Here’s what I do when I want to tear apart a genre. I take pieces of paper and runa vertical line down the middle. On one side I put the scene # and plot summary—just a few sentences to tell what happened in the scene. On the other side facing it I write what the scene did structurally for the story. If a scene shows the hero working in his job and thinking about how his best friend just got married and he wishes he could find the right woman, I might write “see hero in his ordinary life. Establish his core need for love.” There is no exact way to word this. Just keep in mind you aren’t trying to copy the plot in any way. You just want a feel for the pacing of the story and how complicated it is, when certain plot elements come into play, how many subplots and what kinds there are. When you study the mechanics of tone, pacing, description, and all your basic elements, the style and voice will fit the genre. With deconstructing plot, you can get a feel for the actual kind of storytelling you need to do. Many authors use charts to lay out their scenes, and I find them extremely helpful. This is very similar. You may just want to create a brief paragraph summary of each scene in the novel you’re deconstructing, or you may want to go deeper into the details, showing the time covered in the scene, the overall amount of time the entire novel covers, or following subplots. Play around with ideas to find one that works for you. Because I didn’t want to copy the structure exactly when I deconstructed a novel, I didn’t try to match each scene exactly. I wanted more of a general overview so that the plot I came up with could have room to breathe and grow. But you might find you want a much closer match. You might, for example, choose a popular thriller and decide to have the exact number of scenes with each scene basically accomplishing the same objectives, aiming for the same length. Deconstructing can be done with any type of book genre. And it leaves plenty of room for your originality, voice, style, plot ideas. You don’t want to be a copycat. Sure, go ahead and write a mail-order bride historical romance. Yes, there are dozens out there. But they are huge sellers. Thousands of readers want more. There is nothing wrong with adding another one. How original do your plot and characters have to be? Maybe not all that much. But if you can come up with an interesting scenario no one else has done, some characters with problems and personalities that are fresh and engaging, there is no reason your novels won’t sell up there with all the others. So spend time on this and really nail your genre. It may take weeks. Don’t rush. Plot out your story, flesh out great characters, and practice writing a scene or two. Be sure to refer to your research chart that looked at the mechanics for your scenes. Show the chapters to critique partners, or find some readers of that genre willing to give you feedback to see if you nailed your genre. Once you feel you have, you’re ready to get writing that book. Another thing that helps as you read through these books is to keep a notebook and jot down phrases and expressions, word choice. I found this helpful when doing my historical, as I picked up adjectives and verbs that fit the era. I later did more thorough research online for slang, expressions, and vocabulary for the 1870s West. But even with contemporary novels, jotting down interesting phrasing or words that catch your eye can help spark ideas for your book (without copying them exactly). This entry was posted in ebook, Publishing and tagged bestseller, bestselling, Daily Writing Tips, DailyWritingTips, editing tips, genres, thriller, tips, writing tips, writing tools on September 12, 2018 by First Edition Design Publishing. Today’s guest post is excerpted from Writing to Be Understood by Anne Janzer (@AnneJanzer) a professional writer who has worked with more than one hundred technology companies, writing in the voice of countless brands and corporate executives. Few of your readers care about what you know, no matter how many years you have spent accumulating that wisdom. They care about what they need or want to understand. You share much in common with your readers: you both live a world with numerous, competing demands on your attention, limited time for “deep reading,” and perhaps a longing for simplicity and clarity. How do you provide the right amount of information without either oversimplifying the subject or overloading the reader? You’ll have to decide what to include and what to leave out. The more you love your subject, the harder this decision can be. Think of a well-known, familiar song, like “Happy Birthday” or “Jingle Bells.” Sing it to yourself in your head. Then, find a friend and ask them to guess the song as you tap out its rhythm. You won’t expect them to get it right away, but you might be surprised and frustrated by how long it takes them to correctly guess the tune rattling around in your head. At least, that’s what psychologist Elizabeth Newton found when she tested this very thing. In 1990, Newton was a graduate student in psychology at Stanford University. She conducted an experiment in which half of the participants (the tappers) were asked to tap out the rhythms of common songs, while the other half (the listeners) guessed the songs. The tappers estimated how long it would take the listeners to name the right tune. The people tapping were inevitably surprised by the listeners’ inability to hear the tune that matched the rhythm. It seemed obvious to the tappers. This study illustrates a phenomenon known as the curse of knowledge, or the challenge of getting out of our own heads. These people aren’t trying to hoodwink or confuse you. They simply forget that you don’t know what they know. It’s much harder to detect symptoms of this tendency in our own behavior. When smart, caring people write incomprehensible stuff, the curse of knowledge is usually to blame. It plagues experts who write for the layperson, or the industry insider addressing an outsider. Of course, a few knowledgeable and expert communicators avoid the curse of knowledge with apparent ease, but let’s consider them outliers and confess that the rest of us struggle with it. The greater your knowledge, the stronger the curse. Nonfiction writers confront this problem in many phases of the work. For example, we cannot proofread our own work effectively because we already “know” what’s on the page. We use terminology that readers don’t know because it is habitual to us. You can defeat the curse of knowledge during later phases of the work by enlisting others for editing and proofreading. But you must avoid the curse earlier still, when deciding what to cover and how to approach it. Get outside your own head. Before you write a single word, you face a fundamental decision about exactly what you want and need to cover. Answer these three questions. Breadth: Will you cover a single issue or a wide range of topics? Depth: Should you dive into details? How many are necessary? Background: How much does the reader already know, and how much will you need to backfill? These decisions depend almost entirely on your readers. For a distinct, well-defined audience, you may be able to cover a wider range of concepts related to your topic. When addressing a general audience, you may choose to focus on the most important things, and avoid excessive detail. The final form also matters. A book gives you more room to roam; readers expect a greater breadth or depth of coverage. If you are expert in a topic, you may choose to cover it in great detail. For example, masterful biographers like Doris Kearns Goodwin and Walter Isaacson do deep dives into their subjects’ lives, creating works that span several hundred pages. If that’s your approach, you will need to dedicate time and effort to maintaining the reader’s interest. The depth of a treatment can narrow the potential audience of readers. For some books, breadth is part of the essential value, as in Neil deGrasse Tyson’s Astrophysics for People in a Hurry. As the title promises, it describes a massive topic in a slim volume. Tyson went wide, not deep. Writing about complex topics effectively at this level is a rare skill. Tyson deploys analogies with care, frames the content in a human context, and shares his personal enthusiasm and sense of wonder to guide the reader through the universe. The book is a masterful example of writing about a complex and abstract topic. There’s no easy answer to the question of how broad or deep your treatment should be. It depends on your purposes and the needs of your audience. Self-indulgent writers include everything they feel like covering. Thoughtful writers who seek to be understood focus on fit and purpose. Sometimes you have to let things go or put them aside for another project. Focus on serving your reader. Designers, businesspeople, and others often refer to of the KISS principle, which is an acronym for Keep It Simple, Stupid. As a design philosophy, Keep It Simple, Stupid makes sense. Don’t create systems that are more complex than necessary. However, people mistakenly apply the KISS mantra as a filter in other fields, including political messaging, sales materials, and descriptions of technology. Not communicating to patients the complete range of treatment options available or the potential risks of a recommended course of action, for fear of delaying the preferred course of treatment. Taken to the extreme, the KISS mantra shields us from the complexity that we should understand. Certain readers crave simplistic explanations or easy answers that spare them the cognitive work of understanding things that don’t hold their interest. Others, however, may suspect that you’re hiding important details or talking down to them. When explaining complicated topics, beware of the boundary between simplicity and oversimplification. We want to believe that the world is simple enough for us to understand. We like to think that we don’t need layers of experts arbitrating between reality and ourselves, but when we ignore the true complexity of situations, we can inadvertently mislead readers. Sabine Hossenfelder has heard some pretty wild theories about physics—hypotheses that she believes arise from the oversimplification of scientific topics for the general public. Hossenfelder is a theoretical physicist at the Frankfurt Institute for Advanced Studies, and writes about physics for publications like Forbes and Scientific American. She is also author of the book Lost in Math: How Beauty Leads Physics Astray. Her insight into the dangers of oversimplification, however, arises from years spent running a “Talk to a Scientist” consulting service, which she started as a graduate student and still maintains today on her blog, BackReaction. For a small fee, members of the public can pose questions about physics, neuroscience, geology, and other topics, or submit their own ideas about physics. Those theories are creative, interesting, and often not grounded in scientific reality. She blames this, in part, on the tendency of journalists covering the field to simplify the message so much that they mislead readers. Deciding what to cover and what to leave out challenges everyone. Writers, speaking coaches, and others share their advice about striking the right balance. When you’re an insider in an industry, seek advice from those who are outsiders. Just make sure you find the right people to ask. Linda Popky could be considered a Silicon Valley insider. She was named a Top 100 Women of Influence by the Silicon Valley/San Jose Business Journal, and works with tech companies as the founder and president of Leverage2Market Associates. She’s also the author of the book Marketing Above the Noise: Achieve Strategic Advantage with Marketing That Matters. This entry was posted in ebook, Publishing and tagged creative nonfiction, Daily Writing Tips, DailyWritingTips, editing tips, non-fiction, nonfiction, tips, writing career, writing tips, writing tools on September 11, 2018 by First Edition Design Publishing.